One World Week highlights the values we have in common. The theme for One World Week 2012 is “Sharing destiny: Moving towards One World”. One World Week is a UK development education charity with an aim to raise awareness and understanding of cross-cultural and intercultural issues. The seven-day celebration, One World Week, happens annually in October, but there are smaller events happening all year round. One World Week focuses on commonalities that cultures, nations, and religions have. Issues that One World Week sees are important for all of us are earth and its resources, justice, equality, peace, and mutual respect. This year’s One World Week theme asks how can we best shape our lives to contribute to an equitable future for all. Today is World Postal Day, the anniversary of the Universal Postal Union, and a day to celebrate the role of the postal sector in our every day lives. The date October 9th was declared as World Postal Day in Tokyo in 1969, in the 16th Universal Postal Union Congress. Historically, postal services meant individuals who travelled large distances either by foot or on horseback, delivering important messages from village to village. Although the role of postal services has dramatically changed in the digital era, the role of postal services is still vital in many remote areas of the world. Even in areas with a high level of access to digital communication, postal services are important for distributing goods bought from online stores. Mandela fought for freedom, peace, and equality. 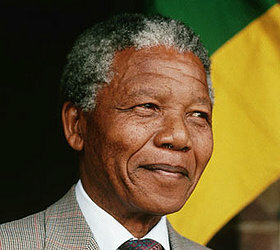 Today is the fourth year the world celebrates Nelson Mandela Day. On the 90th birthday celebration of Mandela, in Hyde Park in 2008, the UN and the Nelson Mandela Foundation decided that this day should be an annual day to celebrate the life and work of Mandela and of a culture of freedom and peace. The basic idea behind the day is simple: The United Nations calls everyone to give 67 minutes of their day for advocating human rights, whether it means supporting your chosen charity or serving your local community. The 67 minutes are based on the 67 years Nelson Mandela gave of his life fighting for conflict resolution, democracy, human rights, peace, and reconciliation. Mandela was born in South Africa, in 1918. He became one of the most well-known anti-apartheid activists, and was imprisoned in 1964 for his views. He spent more than 27 years in prison, during which the political climate of South Africa stormed but essentially stayed unchanged. Straight after his release in 1990, Mandela plunged into his life’s work, and in 1991 was elected the first black president of South Africa. In 1993, he was awarded with the Nobel Peace Prize.